Standard bearers from the Morecambe and District United Services Association on their march from the clock tower to Morecambe Arena on Sunday to mark Armed Forces Day. This weekend the district will celebrate the Armed Forces with a number of events and services. Thousands will come together across the UK this weekend to mark the national day which supports the men and women who make up the Armed Forces community - from currently serving troops to service families, veterans and cadets. The actual Armed Forces Day falls on Saturday, June 27 although Morecambe’s events will mainly be held on Sunday, June 28. 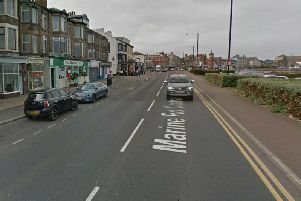 The Morecambe & Heysham Branch of the Royal British Legion will hold what is hoped to become an annual Armed Forces Day parade and drumhead service on Sunday in Morecambe. The parade will begin at the Clock Tower area at 11.45am prior to moving off along the promenade towards the Arena (opposite the Winter Gardens) where a drumhead service will be conducted by the branch chaplain, Father Tom Davis. The parade will be led by Morecambe Brass Band. In Lancaster, the castle will host a free event on Saturday from 10am to 4.30pm, featuring army reserve and cadet forces and for the first time this year the Officer Training Corps from Lancaster University. Additional support is provided by Lancaster University history department with the Streets of Mourning project mapping Lancaster’s casualties of the Great War. The Lancashire Army Cadet Force Band will play sessions both in the castle and in Market Square and The High Society Jazz Band will entertain through the afternoon. The Storey, in Lancaster, will welcome a free talk by renowned historian and author Nigel Sale. “Waterloo – 200 years on” will begin at 7pm on Saturday. Stagecoach is also offering free bus travel this weekend to all uniformed military personnel and veterans wearing their medals, on Friday, Saturday and Sunday.